Well where to start! 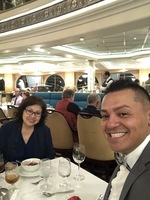 This ship cruise was my very first ship cruise ever! Enjoyed the statement room my grandmother and I had, was a nice size just for the two of us. Dexter our stateroom attendant was very very nice, did an awesome job keeping us happy. The entertainment on ship from live shows to yoga, movies in a nice huge theater to live musical bands were non stop. The cruise consisted of a 14 day and many stops from France, Italy, Greece and Malta! Which we took advantage of the many excursions there were to offer and see! 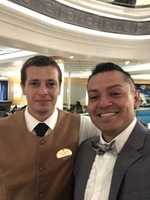 The dining especially formal dining our waiter Davor was so awesome we kept coming back just to see his lovely smile! He was very attentive to us since we only sat at a two setting table. I got to try escargot for the first time and had any of the recommendations of the menu Davor had to offer. The manager sorry I can’t remember his name but is from India he was so awesome too, he always took the time to come by to just chat with us as well! Kuddos to both! So overall regardless of knowing this was a smaller ship have already recommended this same cruise with your company! I’m definitely am highly satisfied with the cruise I as well met many different people around the world! I am definitely coming back!